Norton Sound (AV-11) was laid down by the Los Angeles Shipbuilding and Drydock Co. San Pedro Calif. 7 September 1942; launched 28 November 1943 sponsored by Mrs. Ernest L. Gunther wife of Rear Admiral Ernest L. Gunther and commissioned 8 January 1945 Captain Ben Scott Custer in command. After Pacific shakedown the new seaplane tender stood out from San Diego 26 February and steamed for Pearl Harbor. She reported to Commander Marshall Gilbert Area for training in mid-March and she arrived Saipan 1 April to provide seaplane tending services. Norton Sound anchored 1 May at Aka Kaikyo Kerama Retto and by 21 June had assisted in splashing three hostile air raiders. Air alerts continued until midnight 14 August. Word of the Japanese surrender arrived eight hours later and into September the tender engaged in upkeep and air operations at Okinawa. She steamed for Sasebo Japan 21 September returning to Okinawa one week later. Norton Sound called at Shanghai China 1 October and by the 23d she was at Tsingtao where she tended seaplanes until 7 November. The next day she anchored at Shanghai; and from that time until April of 1946 she remained on duty with the occupation forces between China and Japan. Norton Sound departed Tokyo Bay 7 April for Norfolk Va. After overhaul there she joined the Atlantic Fleet. She operated off the east coast until October 1947 when she steamed for San Diego to rejoin the Pacific Fleet. 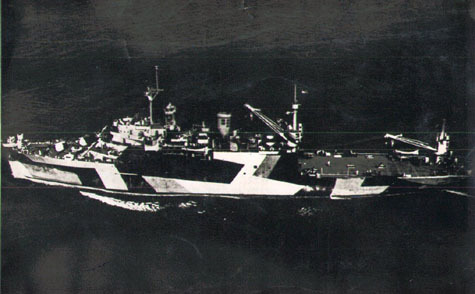 Shortly thereafter Norton Sound was selected for conversion to a mobile missile launching platform. She entered Philadelphia Naval Shipyard in February 1948 for seven months while special equipment was installed for handling stowing launching and controlling guided missiles. Upon completion of her modifications in October 1948 Norton Sound steamed for her new homeport of Port Hueneme Calif. Enroute she conducted tests with Skyhook balloons and off southern California she underwent a very intensive missile training program. Late that fall Norton Sound successfully launched a training missile thus marking the beginning of the Navy's shipborne family of guided missiles. Following installation of launching equipment for Aerobee missiles at Long Beach Naval Shipyard in February 1949 the ship steamed to equatorial waters off the South American coast and successfully launched two Aerobees. These launchings provided fundamental scientific information on the earth's radiation belt. On 1 July 1949 Norton Sound headed for the geomagnetic equator some 1500 miles south of Hawaii and conducted extensive tests with seventeen huge Skyhook balloons and nine smaller balloon clusters all of which carried aloft scientific instrumentation packages. All of these tests had scientific value and emphasized Norton Sound's value to the Navy as a floating proving ground for developing skills and procedures for future tactical guided missile installations in combatants. After special modifications in February and March 1950 at San Francisco Naval Shipyard Norton Sound launched a five ton Viking rocket 11 May in project "Reach". This rocket carried a 500 pound scientific instrumentation package to an altitude of 106.4 miles and provided additional data on cosmic rays. Project "Reach" concluded the first phase of Norton Sound's history as a mobile missile launching platform. This first phase was devoted to extending scientific research frontiers and gaining experience prerequisite to firing tactical weapons. The second phase required the application of the resultant knowledge. The newer missiles launched from the ship had a more direct bearing on the future of the Navy's combatant missile capability. In 1958 Norton Sound participated in project "Argus" From a position south of the Falkland Islands she launched three rockets which carried low-yield atomic warheads. Detonation occurred at an altitude of 300 miles and the effects were monitored by the Explorer IV satellite and by other instrumented rockets. Analysis of data from project "Argus" contributed materially to the discovery of the Van Allen radiation belt. The ship returned to San Diego in June 1959 and resumed Terrier and Tartar test launchings. She continued these operations until June 1962 when she steamed for Norfolk Va. She decommissioned there 10 August and in November she was towed to Baltimore Md. for installation of the Typhon Weapon Control System. The conversion was completed early in 1964 and Norton Sound recommissioned 20 June emerging in her present configuration to continue tasks in weapons research. Baltimore was designated homeport for Norton Sound and for several months she operated in Chesapeake Bay evaluating the Typhon System. Assigned to Port Hueneme Calif. in July 1965 she arrived there the last day of that month. Her mission was then increased to include evaluation of the Sea Sparrow missile the first of which she launched 13 September. During a three month stay at Long Beach Naval Shipyard commencing 15 July 1966 all Typhon equipment was removed following discontinuance of the system. For the next two years Norton Sound evaluated various countermeasures for missile threats to naval surface forces. She also tested hardware designed to enhance ECM capabilities and equipment involving a new concept in gyro design. Norton Sound entered Long Beach Naval Shipyard 13 June 1968 for regular overhaul. The yard also installed a new light-weight 5"/54 gun mount with associated gunfire control components for operational evaluation tests. Into 1969 she continues active in test and evaluation work with the Pacific Fleet. Norton Sound received two battle stars for World War II service.